Choose from the largest selection of spiral coil binding machines on the internet. We carry the full line of Akiles, GBC / Ibico, Renz, Tamerica, DFG and Rhin-O-Tuff systems with options for almost any price range. Whether you are looking for a pair of coil crimping pliers, a light duty manual punch with inserting table, a medium duty manual machine with an electric roller, or a heavy duty electric punch, we have the equipment to fit your needs. Scroll down to see the huge selection of coil binding machines and coil inserters that we carry. Plus if you need supplies we carry those too. We even carry a line of recycled coil for environmentally conscious customers and a massive selection of pre-punched paper and covers to save you time. Welcome to MyBinding video. This is how to choose a coil binding machine that’s right for you. Let’s take a closer look at all the parts so you can make your best decision between the options out there. Side margin control is very common on most machines. This keeps your paper centered so your punches are consistent throughout your entire project. Different side margin controls are different quality holding more specific centering. You’ll want to keep in mind how many different kinds of projects you’ll need and how important centering is to you. Punching is a very important step in the bookbinding process. You’ll need to choose between electronic or manual punching. Manual punching can be quite tedious but is less expensive. And punch capacity, the number of sheets per punch is very important according to the kinds of sizes of documents that you’ll be punching. Depth of margin control is a very common feature on many machines. 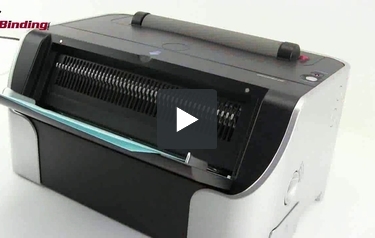 It allows you to make it deeper or more shallow punch on the margin of your paper. Thicker documents are greatly impacted by too thick of a margin. Disengageable die pins is an important feature as well. If your machine can do it, it allows you to cut different kinds of hole patterns which gives you even greater control on centering and allows you to work with different sizes of paper. It really does make your machine more versatile and is generally a sign of a well built machine. Coil insertion is an important and final step in the coil binding process. It’s very tedious to do it by hand so a coil inserter is really important. If you’re going to be binding a lot of documents on a regular basis, you’ll want to have a good coil inserter or even buy one on the side that works as a separate step. The absolute last is the crimping of the coil. These pliers allow you to cut and crimp it at the same time. Most machines come with them but you want to check because if not, you’ll need to buy an extra. If you’re going to be producing a lot of books, you may want to consider purchasing a separate automatic crimper. Here are MyBinding.com, we take serious our customer service. If you have any questions at all, you can give us a call and we can help you find the right machine. We are trying to make a video for every single product that we sell. That way you can see it in action before you buy. For more demos, reviews, and how-to’s, check out MyBinding.com.